Lars Mytting’s Norwegian Wood has been shortlisted for the BRITISH BOOK INDUSTRY NON-FICTION BOOK OF THE YEAR 2016! What is it, that makes Lars Mytting’s new nonfiction book about wood chopping so special that people all over Scandinavia can’t get enough of it? One of the reasons for its great success is definitely its informative content: from different qualities of wood, tools and supplies to the best time for cutting the wood and the quantity of food a wood chopper needs a day to the types of ecological worthwhile stoves – no possible question on the subject of wood is left unanswered. But unlike other non-fiction books on this subject, Mytting provides so much more than just dry facts and tips. He invites all of his readers, even those who never held an axe in their hands, to discover the fascination attached to the process of making firewood and to think about the environmental and cultural aspects related to it. 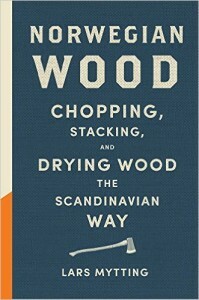 Not only middle-aged men living in Scandinavia but also readers from all over the world, living in all kinds of environments, will be amused by Myttings anecdotes about wood choppers and his thoughts about the correlation between their ways of chopping and stacking the wood and their characters. Reminding his readers that it’s the simple things in life that matter and showing how people all over the world share the wish to live in a warm and safe place with their loved-ones, Hel Ved will most certainly continue to break sales records. The author: Lars Mytting was born in 1968 in Fåvang. Mytting worked as lector and journalist for Norway’s largest newspaper Aftenposten before he published the novels “Vårofferet” and “Hestekrefter. “Hel Ved” is Mytting’s first Nonfiction book and spent more than a year on the nonfiction best-seller list in Norway.